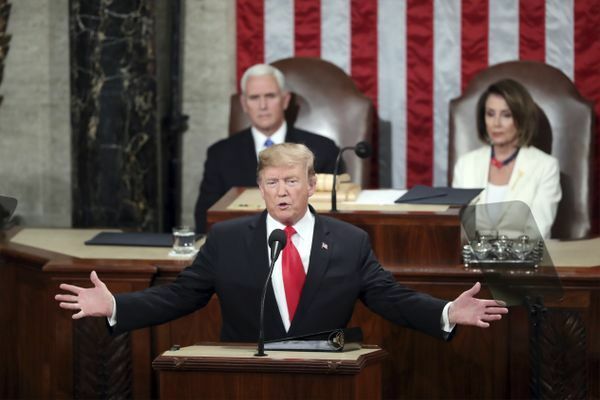 Yesterday evening the President of the United States, Donald Trump, delivered his State of the Union address for 2019 to the Congress, causing expected backlash and containing unanticipated calls for unity and an end to politics of “revenge, resistance and retribution”. The divisive president began the highly-televised address with pleas for unity in the ruling parties of the country and for Americans to come together, but quickly divulged into exaggeration and baseless rhetorical statements. There were pushes for Democrats to assist the Republican presidents hopes for an eradication of the AIDS virus epidemic within the next ten years, as well as the usual hopes that the Democrats would allow for the construction of Trump’s Mexican border wall in some capacity. Trump subtly mentioned the scandals that he and his contemporaries are currently entangled in, saying that “If there is going to be peace and legislation, there cannot be war and investigation. It just doesn’t work that way.” This statement, plus another where the President touted the United States as having “the hottest economy anywhere in the world,” comes as a jab at Democrats, trying to illustrate that, in Trump’s view, the economy is good because he is president, and if they wants it to remain that way it is detrimental if he is investigated. The speech was regularly interrupted with applause from the Republican camp, and there have been many unpredicted outcomes such as a video and picture of Nancy Pelosi, Speaker of the House of Representatives, sarcastically applauding Trump following part of the speech calling for “co-operation, compromise and the common good”. There is also another picture making the rounds, that of an 11-year old boy, also with the surname Trump, falling asleep during the President’s speech. The address comes at a time where both ruling parties in America are highly divided, following the longest government shutdown in the history of the United States and the ongoing border wall debate continuing irrespective of President Trump’s attempts to secure funding. There was no mention of his plans to call a national emergency if a compromise surrounding the wall could not be met by February 15th, with Trump only mentioning the “lawless state of our southern border is a threat to the safety, security and financial well-being of all Americans”.